Contemporary Diplomacy offers a comprehensive introduction to the changing actors, venues, processes and functions of diplomacy in the 21st Century. Aimed at students and practitioners alike, this textbook explores the critical theoretical tools that can be employed to understand diplomacy and its evolution since the end of the Cold War. It also shows how the study of diplomacy can contribute to the analysis of 21st Century conflict and international relations more broadly. The book is divided into 2 main parts: part I focuses on diplomatic actors and venues: from the traditional nation-state actors of classical diplomatic studies to newer types of actor, such as multilateral organizations, supranational polities, global firms, civil society organizations and eminent person diplomats. Part II examines diplomatic processes and functions, reconsidering the core diplomatic functions of representation and communication in light of new communications technologies and the increased importance of public diplomacy. It looks in-depth at specific functional areas of diplomacy - including economic, military and security, and cultural diplomacy Ð and how they are managed. The concluding chapter reflects more broadly on the relationship of diplomatic theory to practice and considers the range of challenges facing diplomats today. This book will be essential reading for students of diplomacy, politics, international relations and conflict studies. Geoffrey Allen Pigman is a member of the Faculty in Political Economy at Bennington College. "This book is a must-read for anyone who wants to understand global interactions through diplomacy and, in particular, the role of diplomacy in today's turbulent world." "Contemporary diplomacy is being handled by larger numbers of people dealing with a larger number of issues than ever before. Its methods and its structures are evolving, sometimes creakily, to match. This book gives the first complete account of where and why these changes are occurring and it is simply essential reading for all who study diplomacy and its place in 21st-century global governance." "This incisive study straddles with ease the theoretical and practical worlds of diplomacy. A valuable and timely addition to the literature with several novel features on the role of non-state actors." 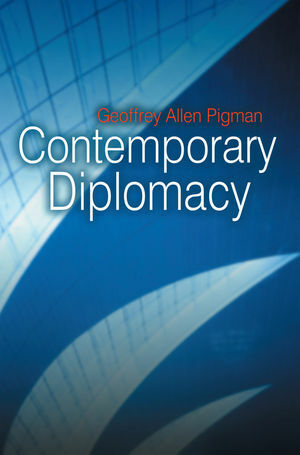 "The clarity of its argument and the quality of the research underpinning it, as well as the elegance of its writing, make Geoffrey Pigman's work an essential book for students and scholars interested in the dynamics of diplomacy in the post Cold War world." Suitable for both students and practitioners, this is a comprehensive introduction to the changing nature of diplomacy in the 21st Century. Provides a thorough account of the evolution of diplomatic actors, venues, processes and functions from the end of the Cold War to the present day. Presents in-depth analyses of economic, military, security and cultural diplomacy, concluding with a broad reflection on the range of challenges facing diplomats today. Essential reading for students of diplomacy, politics, international relations and conflict studies.